11 people died in auto accidents in New York City last May compared to 20 in April and 18 for the same month a year ago. This is a the lowest number of traffic deaths recorded since March 2016 where the number was also 11. This record low number of auto accident deaths occurred despite traffic accidents reaching 20,689 during the same month. This is the highest number of monthly motor vehicle accidents ever recorded in the city. The month before there were 17,585 motor vehicle accidents and 19,911 in May last year. While the number of traffic accidents has been increasing steadily, the number of deaths related to theses accidents have been declining over the last 4 years. This decline may be explained by the various street safety initiatives that have been launched under the umbrella of the Vision Zero Program to reduce traffic deaths in the city. There are less and less deaths on the streets of New York City but there are more and more injuries. Last May, 5,314 people were injured in motor vehicle accidents in the City compared to 4,444 the month before and 5,415 the same month a year ago. While the number of people injured in car accidents was higher in May 2016 than in May 2017, the global trend of car accident injuries is on the rise. 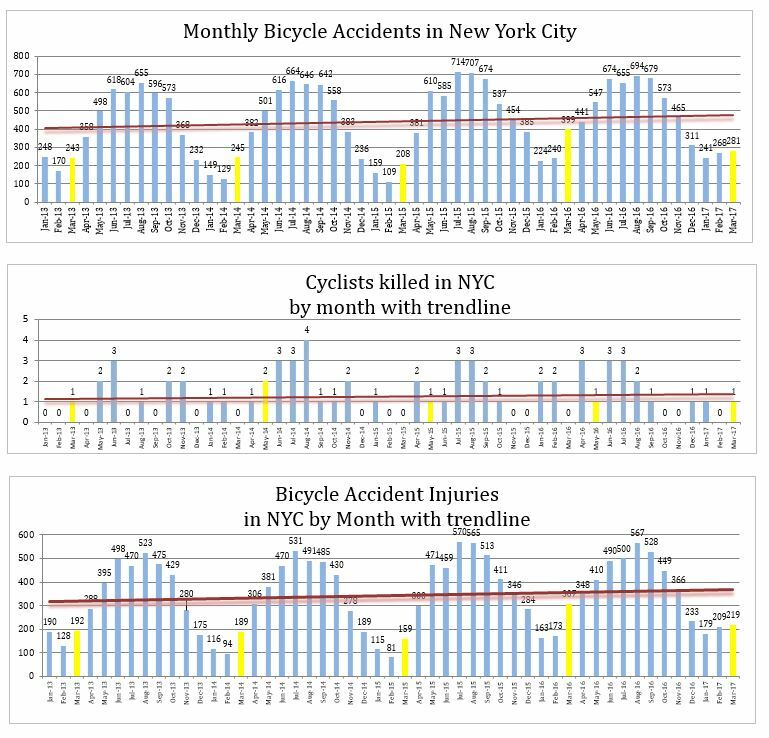 The number of motor vehicle accidents has been rising faster that the number of injuries and both the ratio of total deaths and total injuries compared to the total number of traffic accidents are declining in New York City. These ratios indicate that over the last 4 years the streets of New York City have become safer. Among road users, pedestrians are the most at risk of being killed in a traffic accident. In May, among the 11 people who were killed in car accidents, 7 of them were pedestrians.To reduce the number of pedestrians killed in traffic accidents is one of the main priorities of the Vision Zero program and one of the most difficult to realize. Since Vision Zero was launched in 2014, pedestrian deaths declined only slightly while motorists deaths declined more significantly. Another concerning number is the number of pedestrians who were injured last May. Before Vision Zero started, 981 pedestrians suffered personal injury in an auto accident in May 2013. After the street safety program was launched at the beginning of 2014 the number of pedestrian injuries went down to 882 in May 2014 and continued to decrease to reach 808 in May 2015. Unfortunately the number of pedestrian injuries started to increase again to reach 822 in May 2016 and 913 last May. Globally the trend is still decreasing but it has been flattening over 2016 and 2017. Mayor de Blasio has been encouraging New Yorker’s to use their bikes and many of them are now commuting daily on the many bicycle paths that have been created all over the city during the past few years. Despite the increasing number of bike lanes implemented recently, using a bike in the city can still be dangerous. The number of accidents is still on a rising trend as are the number of bicyclists killed or injured in accidents every month. However despite being on a rising trend the total number of bicycle accidents, as well as the total number of bicycle accident injuries, decreased last May compared to May 2016. The number of bicycle accident deaths remained stable over the same period. Lat May 1 person died and 219 people were injured in 281 bicycle accidents compared to respectively 1, 307 and 399 in May 2016. This may be a first sign that the numerous initiatives launched over the last few years to protect bicyclists are starting to be effective. For the second year in a row the number of motorcycle accidents has been declining in May. There were 252 motorcycle accidents last May compared to 259 in May 2016 and 275 in May 2015. Motorcycle accidents always increase from April to May due to obvious seasonal factors. The number of bus accidents went down to 585 in April from 683 in March and then jumped to 771 last May. Every year the number of bus accidents increase significantly between the month of April and the month of May. Maybe more tourists are visiting New York in May? The number of truck accidents also recorded a significant increase from last April to last May. It went from 1,288 to 1,665. However it decreased compared to May 2016 when 1,723 truck accidents were recorded by the NYPD.